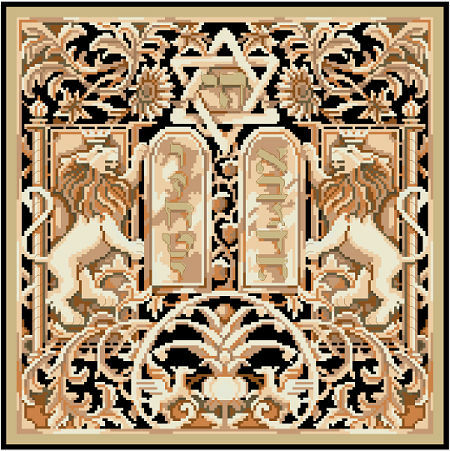 Regal lions holding scrolls representing the Ten Commandments given to Moses on Mt Sinai are beautifully depicted in this traditional Jewish paper cut style design. The unique versatility of this design is that it is suitable for those who wish to needlepoint or cross-stitch. 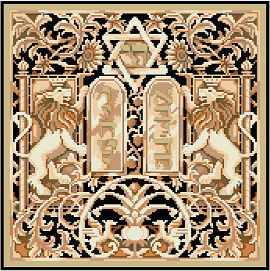 Ideas for finishing include: pillows, matzo covers, tallit bags, challah covers or framed as a wall hanging to be given as anniversary or wedding gifts that will be handed down from generation to generation. Contents: Stitch Count 172w X 172h: Finished size on 14ct 12" x 12"